PRINCE SEVEN - No EGO-- Inspirational Casual Wear & Accessories for the Believer!! Click the button below to add the PRINCE SEVEN to your wish list. What do you see when you look at me? God's perfection! 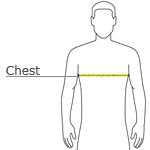 To determine circumfrance of chest measurements, double the number below. Manufacturer notes a 1/2 inch tolerance.